Venlo, The Netherlands – Groundbreaking RollerForks® save space, money and time at Teijin Kasei Europe. Palletless handling of flexible intermediate bulk containers (FIBCs) has become commonplace. The distinctive sound of the Rollerforks® is music to Maurice Beurskens’ ears, manager at Teijin Kasei. He watches as forklift driver Ferenc Beelen simultaneously unloads two FIBCs using a synthetic slip sheet under the load instead of a conventional wooden pallet. Goods are unloaded and handled more efficiently and pallets are now only used for internal storage. ‘The first thing I thought when I saw RollerForks® for the first time was, “Is that it?”. Compared to our previous push-pull system, RollerForks® looked so simple,’ says Maurice Beurskens. RollerForks® have become an essential link in the logistics chain for this Japanese manufacturer of high-quality synthetic granules used in the CD and DVD production process. The company has managed European distribution of its Panlite Polycarbonate from Venlo since 1992. 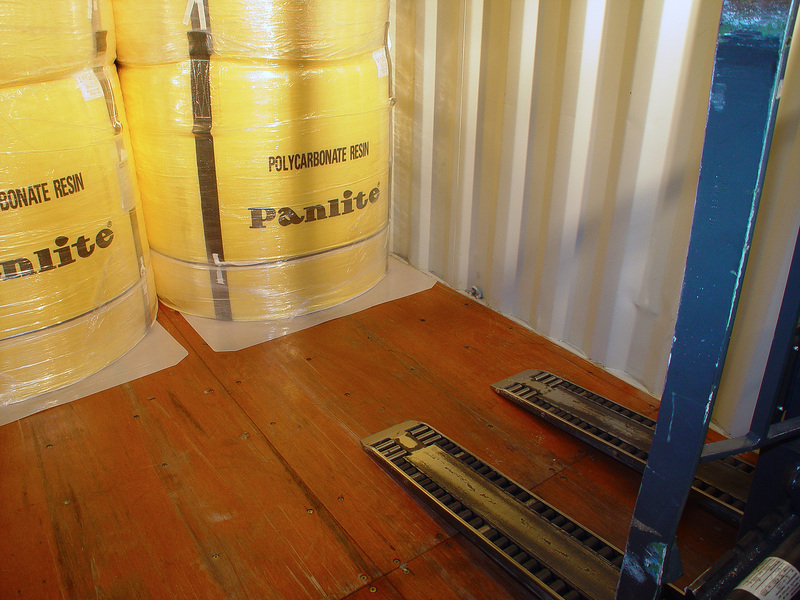 Panlite is imported from Japan and Singapore in FIBCs weighing approximately 800kg (1765 lb), which are transported in sea containers. In partnership with Seacon Logistics, FIBCs are repacked into containers with a capacity of 22.5 tonnes. Initially, FIBCs were placed on pallets inside containers meaning space was lost. ‘Using slip sheets instead has increased volume by up to 7 to 8%,’ says Beurskens. ‘But it meant that we had to use push-pull systems for handling the slip sheets’. Push-pulls were seen as unavoidable because no other option was available at the time. ‘Forklift truck drivers had to learn to work with them. Moreover, two trucks were needed, one equipped with a push-pull and one with standard forks to transport the load to our temporary storage. The second driver often had to wait for long periods while FIBCs were being transferred to pallets.’ Time was also lost due to problems with push-pulls. Initially, it seemed that the irregular shape of the FIBCs was well suited to push-pull equipment. However, cylinders broke, steel deformed and repairs had to be carried out regularly. ‘Container unloading slowed down and costs mounted,’ recounts Beurskens. ‘This wasn’t only due to the weekly repairs, but also because drivers accidentally damaged product packaging during handling operations. To prevent any possible product contamination, we have to reject damaged FIBCs and recycle them. At this moment several of our facilities our using the RollerForks.